Tank or Tankless: Which Water Heater Fits Your Lifestyle Best? Tankless water heaters sound like such a win-win on so many levels. Small, eco-friendly, energy efficient… they are definitely the underdog favorite for the green-minded homeowner! Yet tankless water heaters are not the best fit for every family. To date, tankless water heaters are catching on slowly (about one sale here in Canada for every nine tank water heater sales) and not everyone is a fan. Above and beyond any concerns about energy savings, water waste or even appliance size, what matters most when selecting a new water heater is evaluating your family’s household water usage habits, patterns and frequency. In this post, we take a timely look at the ongoing tank versus tankless debate, helping you decide which water heater best fits your lifestyle so you can make your own personal wise choice. By and large, most homeowners and businesses still opt for the traditional tank, or storage, water heater when it is time for a water heater upgrade. This is because, first and foremost, the tank water heater is what people know best. Some people still aren’t really aware any other viable option even exists! But there are other even more compelling reasons why the tank water heater is still the fan favorite for most households and business owners. Plus, with a tank water heater you have hot water standing at the ready for whenever you need it, whether it’s at 4pm or 4am. This can be particularly important if several family members regularly need hot water at the same time (i.e., one person showers while another person runs the dishwasher). A tank hot water heater is also typically more economical to buy and install because you have more options and there is more competition in the marketplace between manufacturers and distributors. Finally, today’s energy-efficient tank water heaters may last 15+ years (older models have a life expectancy of 10 to 15 years). The tankless, or on-demand, water heater is still an underdog in larger, more well-developed areas and countries. In fact, the tankless hot water heater first got its start in places like China and Europe, where finding space inside the home for a 50-gallon water tank can be challenging. However, with rising concerns about increasingly scarce natural resources, there is commensurately rising interest in appliances built to conserve. The tankless water heater is now finding favor in less-expected places for precisely this reason. 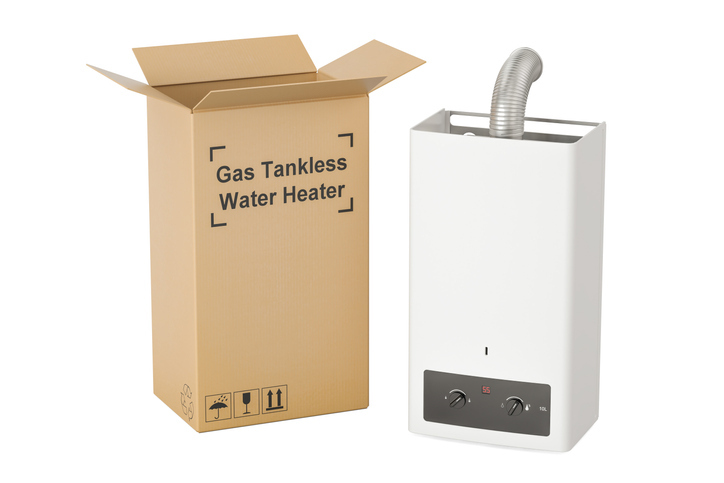 For starters, most tankless water heaters are about the size of your standard carry-on wheeled suitcase, and they are wall-mounted. When you opt for a tankless water heater, suddenly you get about 10 feet of usable floor space back! Tankless water heaters can run on electricity or gas just like a tank water heater. However, the more robust gas hot water heater is really only a viable option cost-wise if you already have gas at your property. Otherwise, the costs to run a gas line could blow your budget out of the water. Tankless hot water heaters don’t need as much cleaning and maintenance as a traditional tank water heater, although you don’t want to completely forget about your tankless unit either! But most compelling in a “save the planet” kind of way is this: a tankless hot water heater can save you money on energy costs as well as water waste, since the unit doesn’t work unless a demand for hot water rolls in. Today’s tankless hot water heaters can last 20+ years so long as water use is reasonable. Let’s take a closer look at the costs to purchase and install a tank versus tankless water heater. Keep in mind here that your personal costs can also fluctuate based on local energy prices. The U.S. Department of Energy takes some of the heavy lifting out of this chore by sharing averages gleaned from water heater research in North America. The average household uses 64 gallons of water daily. Heating that water costs $400 to $600 per year for the average family, or 14 to 18 percent of the household energy bill. Tankless hot water heaters can deliver 8 to 34 percent greater energy efficiency than a tank water heater depending on water use. This amounts to an annual energy savings of about $100. Tank water heater purchase and installation estimates averages about $865 (50-gallon tank). Tankless purchase and installation estimates range from $1,470 to $2,500. Choosing the right hot water heater—tank or tankless—really boils down (pardon the pun) to evaluating your personal household water use habits. The typical tankless hot water heater can heat and dispense from two to five gallons per minute depending on the energy source (gas typically outperforms electric tankless water heaters). A 50-gallon hot water tank heater, in contrast, has 50 gallons of hot water to dispense as needed. What this basically means is that with the average tankless water heater, one person showering will max out capacity (the average showerhead has a 2.5 gallon-per-minute flow rate). So now it is up to you: tank water heater vs. tankless water heater— which will you choose? Here at Shipton’s Heating and Cooling, we have nearly a century of expertise assisting our residential and commercial clients with selecting new appliances that can save money, time and energy. Could you use an industry perspective to help you pick the perfect new water heater for your household or commercial business? Contact us online or give us a call at 905-549-4616 to find out!